Here is another layout we made at the Scrap Gals Seattle Retreat! 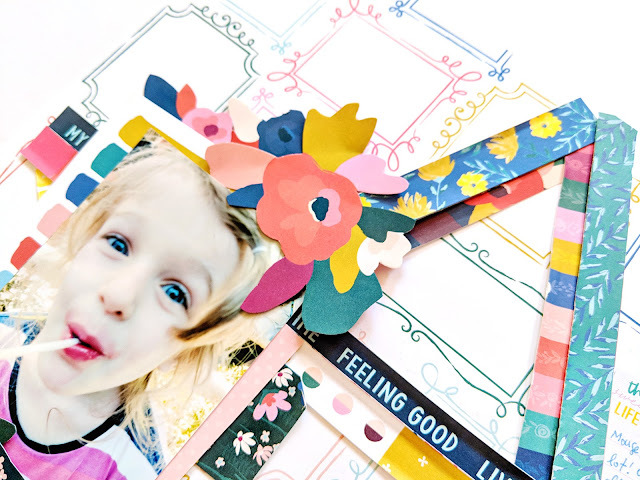 Use Pick-Me-Up Paper 19 with all of the frames for the background. Trim off all the barcode strips from all of the patterned papers. Additionally, trim a ½” strip of patterned paper from the B-side of Paper 01, the B-side of Paper 02, and the B-side of Paper 13. 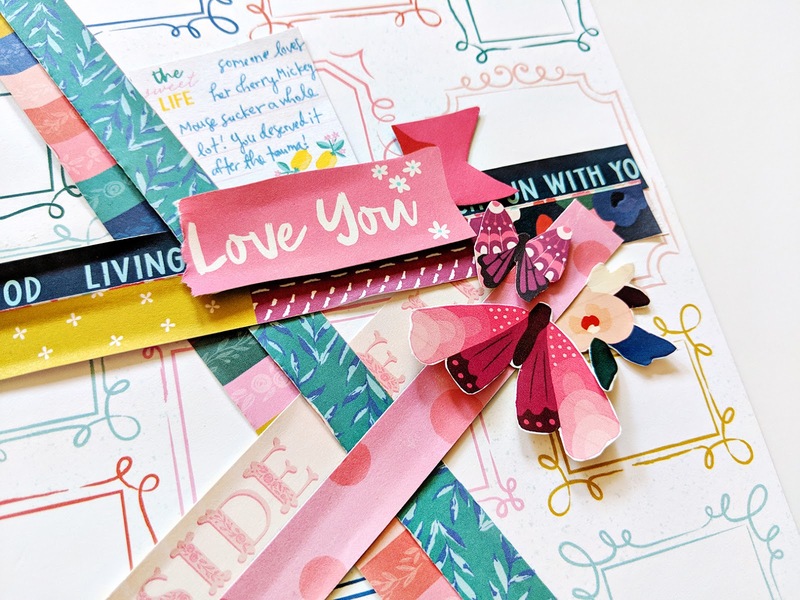 Also trim out the “Living on the Bright Side of Life” strip, the blue floral strip, and the “my happy place, what a great time, etc” sentiment strip from Paper 01. I did not use the barcode strips from Paper 14 or Paper 19 but you can if you want! Place the paper strips into a star shape, two paper strips per side, adhere them in place, and bend up the edges for dimension. Cut out the colorful striped sentiment card from the top right corner of Paper 01 and the “life is good” pink card from the middle left side. Use those cards as layers for a 3x4” photo then adhere the pieces on the left side of the layout. Fussy cut flowers from Paper 02 and layer them on and under the photo. Cut the top of a green floral tag from Paper 13 and tuck it under the right edge of the photo layer. Fussy cut the “Hello Sweetness” and “You’re Special” pennants from Paper 13 and adhere them below the photo. Tuck a lemon Journaling Spot into the top right side of the star and write journaling on top. Place the other half of the pink “love you” banner below (the first half was used on the 2nd layout). Apply stork, moth, butterfly, and flower Rub-Ons to excess light colored paper, fussy cut them out, and layer them around the journaling and photo as shown to finish. 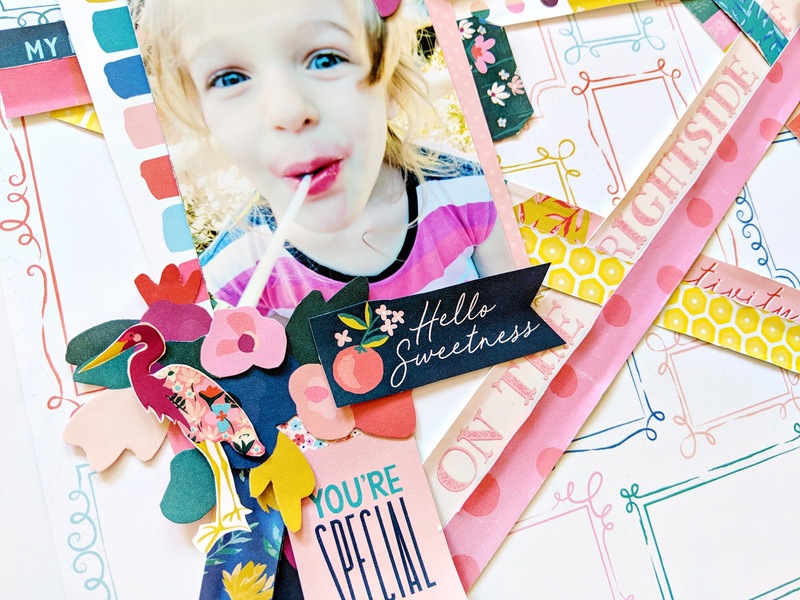 You might even have enough leftovers in the kit to create more layouts on sheets of cardstock or cards! Kill the kit!